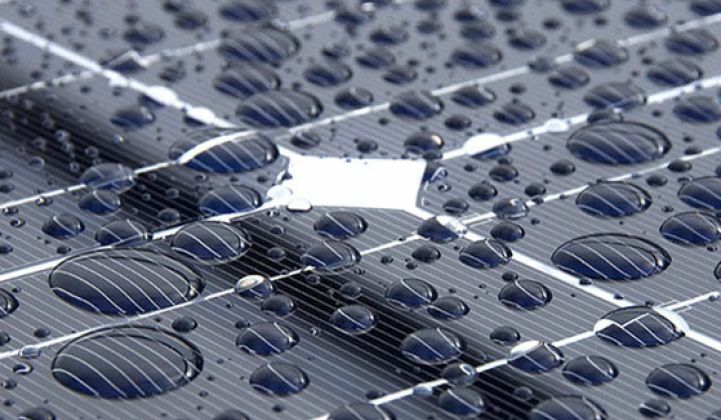 Do You Wash Your Solar Modules Often Enough? This formula may be able to give you a better answer. Figuring out how often to wash solar panels is more complicated than it might seem. Washing arrays too often can be a waste of money; washing them too infrequently results in soiled modules that reduce electricity production, and thus, the value of the project. Operators typically follow a simple, low-risk policy of washing once a year just before the summer “money maker” month. It's usually a rigid schedule that project owners don't stray from, regardless of actual soiling levels. That's according to a new white paper by David Young, the vice president of asset management at Solarrus Corporation, entitled "To Wash or Not to Wash?" Solarrus is a service company for solar projects and electric-vehicle charging stations. In the white paper, Young attempts to take the guesswork out of cleaning by using a mathematical formula to determine the optimal washing frequency. By using the formula and adhering to a mathematically calculated wash cycle, Young believes operators can expect hundreds of thousands of dollars in extra revenue. That could mean cleaning panels every twenty to 40 days during certain periods of the year. The loss of power generation and revenue due to soil accumulation occurs at a constant rate. Washing is paid as a lump sum at the time of service and restores power generation to 100 percent. Seasonal and weather effects are ignored. There is no output capping. W: The cost of washing in dollars. M: The maximum revenue production increase just after washing in dollars per day. r: The rate of revenue lost due to soiling in dollars per day. T: The time between washes in days. To test his formula, Young used data from a 20-megawatt plant in the Central Valley of California. With one wash costing $60,000 (= W) and the daily production revenue loss due to soiling in summer being (r =) $240/day, the optimal washing frequency is twenty-two days. The tricky part of this calculation is to determine the correct 'r' value. A constant rate of revenue loss due to soiling over long periods of time does seem unrealistic, Young concedes. System performance is instead impacted by the physical rate of soiling, the revenue rate being earned for each kilowatt-hour generated, and the irradiance each day. It might be next to impossible to account for these factors in some regions, Young concludes. However, although they vary widely throughout a year, these factors do occur in fairly predictable seasonal patterns. While this model now accounts for the seasonal patterns for the plant in Central Valley, the 'r' value for each period still needs to be calculated. According to Young, the most reliable method is to set up a control array on site that is washed frequently, often weekly in times of heavy soiling rates. Solarrus also installed an array that matched the control array but was not cleaned at all. Young then compared the rate of change in the different output rates between the control array and the matching array and translated it to revenue. Finally, Young calculated the lost revenue for a period between June through September, taking into account that the operator of the plant budgeted only one wash at the beginning of the summer season. The formula showed that the modules should have been washed three times in a 102-day period, which, according to Young's calculations, would have netted the operator $203,624. Although the results reflect only one set of circumstances for one solar power plant over a period of just 102 days, Young's approach may take some of the guesswork out of the decision to wash modules of solar power plants.